SQL in 60 Seconds is a series where I share SQL tips and tricks that you can learn and start using in less than a minute. 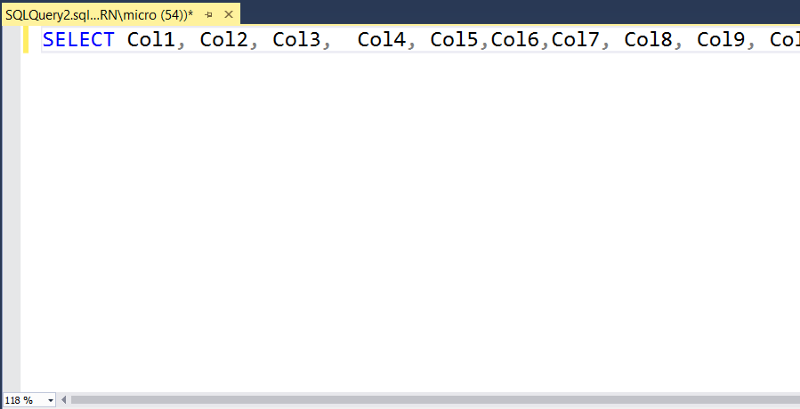 Have you ever copied and pasted a query into SQL Server Management Studio and been annoyed that the list of column names in the SELECT statement were all on one line? There are 30 columns here. Ugh. You can make the query easier to read by putting each column name onto its own line. and replaced it with a comma (,) and a new line (n) and tab (t). Sure, this trick isn’t going to give you the same output as if you used a proper SQL formatter, but this technique is free and built straight into SSMS. This article made me look for other SQL formating solutions and I found ApexSQL Refactor. It’s free, embeds on SSMS and is incredibly powerful.